I have always loved antlers. Don't get me wrong, I am not a hunter, but I do adore the hunt country style. I recently spotted this arrangement (above in the middle) online by a company called Botanica. I loved its simplicity and the ability to change it up seasonally. When I inquired the price for this arrangement, I was shocked. 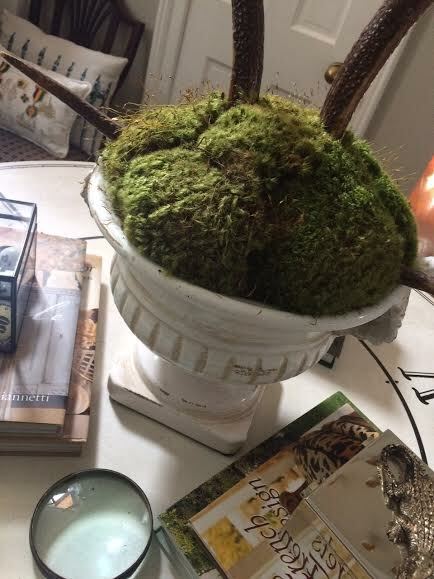 Antlers, moss, and a faux bois container for $398.00... WOW!!! I do not think so, y'all! 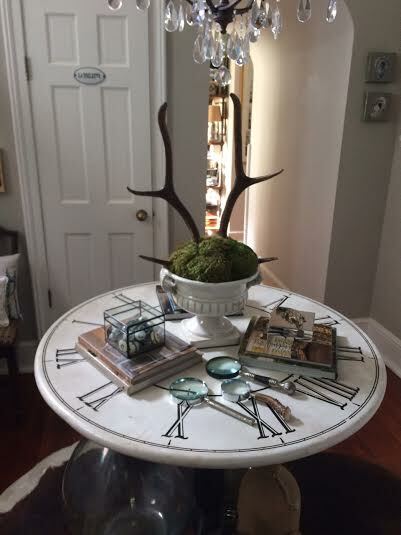 I had a large set of antlers that I purchased from an antiques distributor while I lived in Atlanta. The antlers were originally attached to the skull, but I had the contractor use his skills and cut the antlers from the skull. The antlers are large and impressive. 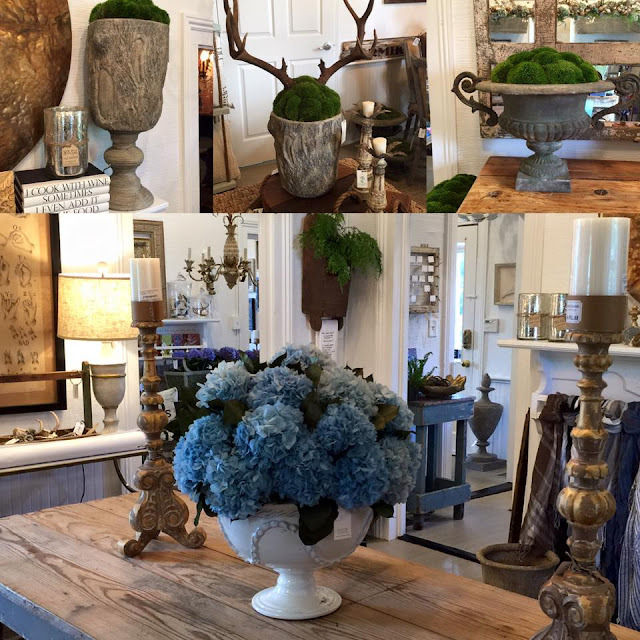 I brought the antlers along with the photo to floral designer Chad at Dunn & Sonnier on Magazine Street. I purchased a new container, and for less than $200.00, I had a unique arrangement. 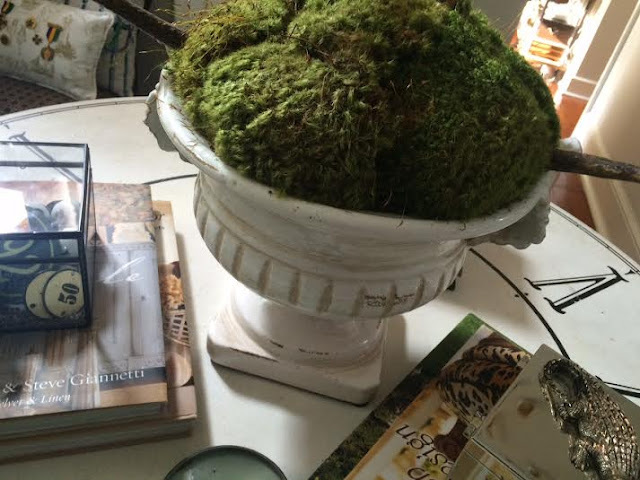 The addition of moss adds to the natural feel of the arrangement. I envision using it in the coming months to decorate for Halloween (crows on the antlers, fake eyeballs at the base), Fall (branches and Fall leaves, acorns at the base), Christmas (red berries in the center, ornaments handing from the antlers). Your suggestions are appreciated. 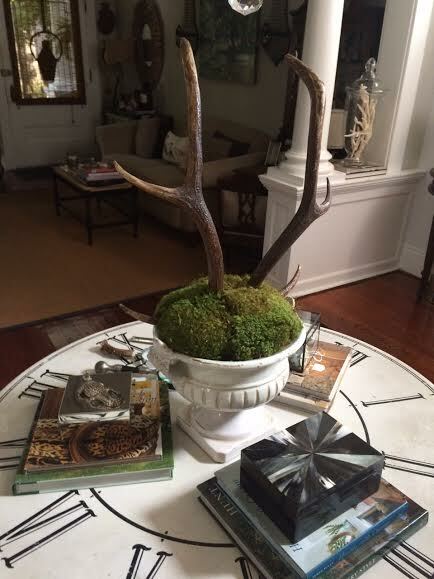 The antler arrangement is perfect on the central stair parlor table. Love it, much rather yours ! Thanks, Ann! I'm partial too. Chad did a great job. Way better than the original Ron... I love antlers my self specially this time of the year. Very cool! 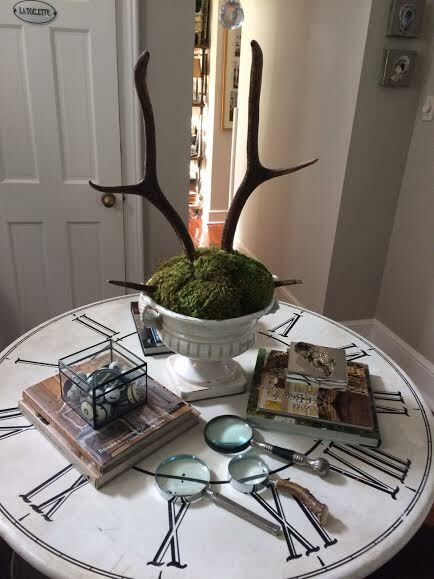 Antlers are so in right now...I see them gracing dining tables mixed with candles too. Can't they fall off naturally in the wild? Or are they all from dead deer? Kudos to you on the arrangement. That is crazy expensive when you can create it yourself. Looks great. I also love antlers and pheasant feathers. So earthy (without having to get all that earth actually ON me!). Love it! I prefer yours to be honest, but have to be honest...you are so stinkin' talented, I believe you could have pulled that off yourself!! However, Chad did a fabulous job. I like yours so much better. It looks fabulous. I'm in love with that clock table. Wow Ron I love what you came up with. I know you'll make good use of the antlers with your decorating ideas. Love that base used for the arrangement. what a great alternative to purchasing that expensive arrangement! I love the look of the antlers and the moss. I have a lot of antlers down in my basement that I bring up every now and then. I love antlers.